Kawasaki cordless combo kits - A revolution in the tools technology. 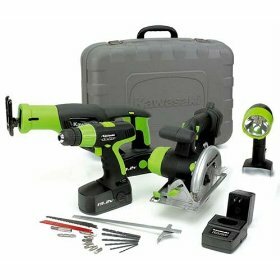 The Kawasaki cordless combo kit is a fully equipped kit for any repairs and projects done in the house. Its matte grip is highly comfortable and does not slip. Kawasaki has given its consumers immense satisfaction with its products. It has made life easy and triggered the curious nature of each person. Presently it has launched a wide range of cheap power tools that can fill your life with fun and happiness. This novel line of tools with exceptional performance will thrill you as they have the 35 years reliability of Kawasaki, a sleek look and superb performance, not to forget the unique warranty. Kawasaki cordless combo kit has a 3/8 drill/driver with keyless chuck, 5-1/2 circular saw with 24-T blade, reciprocating saw with 7/8 blade stroke. It has 1.3 amp hour twin battery packs accompanied with a charger, a pair of circular saw blade set and reciprocating saw blade set. The 3/8 keyless checks for making changes quickly. The drill driver has 24 positions of torque settings. The battery is very powerful. It is 18 volts and it is made of nickel cadmium. The reciprocating saw has a 7/8 blade and it can deliver 2600 strokes in a minute. The circular saw has a cutting angle up to 45 deg. The rip fence is removable. There is a safety lick trigger and the speed is changing. The input of the charger is 120 volt 60 Hz .It consists of 24 tooth carbide blades for getting rapid clean cuts. The work light features are the non slipping matte grip, an extra bulb, a wrist lanyard. It is extremely light in its weight and the design is compact. Its pivoting head emits light in the direction of your need. Kawasaki cordless combo kits have been by and large appreciated by all. They feel the idea is unique, it is handy. You do not have to keep hunting for tools when you wish to embark on some project. All the tools are readily available and bunched together, it is indeed a boon. However there has been criticism of the product as well. Some opinions state that the armored case will not be durable as it is made of cheap plastic that can be destroyed easily. They want that the case should have been made of strong material so that when they are thrown in a truck then they can survive it. Others feel that the tools are of inferior quality. However this is the opinion of the minority. These kits are available online. If you are interested then do a market survey and then decide. You will not regret buying it. These are a necessity in every household. It is convenient, easily accessible and portable. They are not highly priced so everyone can think of buying them. People are sure before they actually buy as the name of Kawasaki is a trusted and valued name in this field since the last 35 years. Return From Kawaski Cordless Combo Kits Page to Home - Finishcarpentryhelp.com.